Thousands of people are said to be short of water, electricity and medical aid because of the fighting. The US president, Barack Obama, has said any Russian intervention without Kiev's consent would be unacceptable and violate international law. 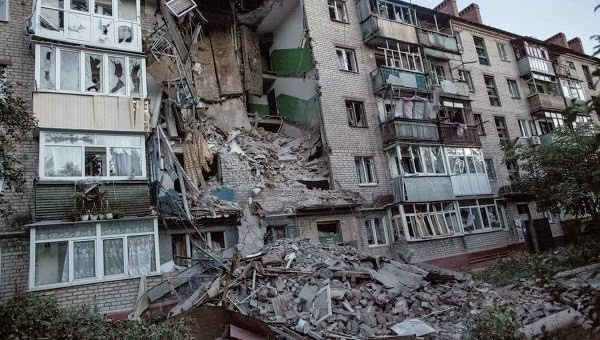 Despite both the regime in Kiev and the International Committee of the Red Cross (ICRC) already having agreed in principle to the aid mission, current dithering now seeks to delay the supplies from reaching desperate civilian populations encircled and bombarded by regime forces. Absent is the howling indignation that was voiced in Syria when Damascus leveled similar restrictions to international aid sent to terrorists now revealed to be Al Qaeda's Al Nusra franchise and its founding organization, the Islamic State in Iraq and Syria (ISIS) currently ravaging both sides of the Syrian-Iraqi border in a rampage of unprecedented brutality and scale. An international rights group said Friday that Syria's government was obstructing aid to war-torn areas by denying aid agencies permission to use rebel-held border crossings, affecting the lives of some 3 million Syrians living in tough-to-reach places. And while US President Obama claims, "any Russian intervention without Kiev's consent would be unacceptable and violate international law," it should be noted that NATO and several Persian Gulf regimes did the "unacceptable," in violation of "international law," and sent supplies to terrorist-held territory in Syria without Damascus' approval. Nine trucks carrying food and other supplies crossed into Syria through a Turkish checkpoint Thursday -- the first to do so under a UN resolution authorizing cross-border aid deliveries without Syrian government approval. The council unanimously approved a resolution on July 14 authorizing cross-border delivery of aid to Syrians in rebel-held areas without government approval through four crossings -- two in Turkey, one in Jordan and one in Iraq. Despite circumstances in Ukraine favoring the circumvention of Kiev's approval more so than in Syria where it is now confirmed foreign terrorists, not "Syrian rebels," were waging war against Damascus, it is unlikely that the United Nations will approve of doing so and will instead back the hypocritical dithering and denial of aid to civilians it itself admits are in desperate need. Compounding the humanitarian crisis is the fact that Kiev's punitive operations in eastern Ukraine are headed by literal Nazi militants raised by the Ukrainian Interior Ministry itself. The Azov Battalion is reportedly engaged in combat operations in civilian areas - a group of Nazis admittedly spearheading many of Kiev's most crucial operations. As Ukraine’s armed forces tighten the noose around pro-Russian separatists in the east of the country, the western-backed government in Kiev is throwing militia groups – some openly neo-Nazi - into the front of the battle. 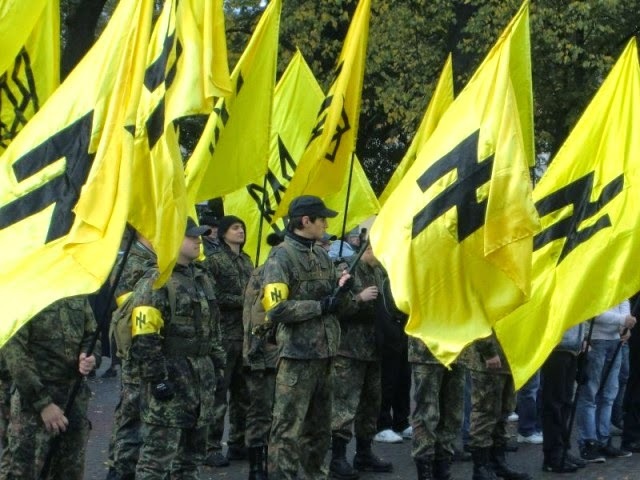 Far from a "fringe group," Azov was raised by the Ukrainian Interior Ministry itself, its directorates issued by Kiev. Russia attempting to send humanitarian relief to civilians encircled and terrorized by literal Nazis could not be a clearer cut case of a necessary humanitarian intervention and was in fact the underpinnings of the Allies in World War 2. That the West is actively attempting to block such an intervention shows that some of the Allies have clearly shifted ideologically, descending into previously unplumbed depths of human depravity. Essentially WW2 in reverse - the West finds itself harboring the scourge of Nazism, not confronting it. Russia, as it did decades ago, finds itself once again confronting the horrors of bigotry, racism, and fascism menacing its borders and brutalizing people it considers "subhuman." Hypocrisy in the West more breathtaking could not be invented by the Kremlin. Indeed the US will claim that sending humanitarian aid into communities besieged by literal Nazis where the regime in Kiev has intentionally destroyed infrastructure to break the populations' will is unacceptable and a violation of international law, while sidestepping Damascus in Syria and sending weapons, cash, equipment, and supplies to terrorists now at the center of a regional conflagration. 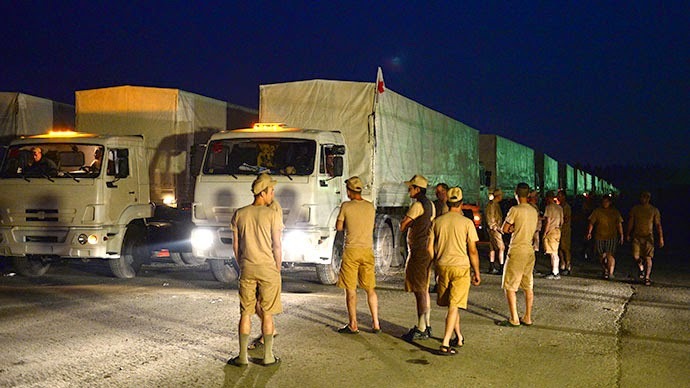 While the civilians Russian aid is destined for may never receive it, Russia's attempts to intervene with unarmed convoys of aid instead of airstrikes and terrorist proxies as NATO did in Libya in 2011, exposes once again the astounding hypocrisy of the West and the double standards that constitute the unifying principle of all its says and does on the global stage. It will only become increasingly difficult for the US to hide what is naked imperialism as it wears down the tenuous pretexts its hides its otherwise illegitimate intentions behind. Russia, as it has continued to do, has committed to a less confrontation strategy. 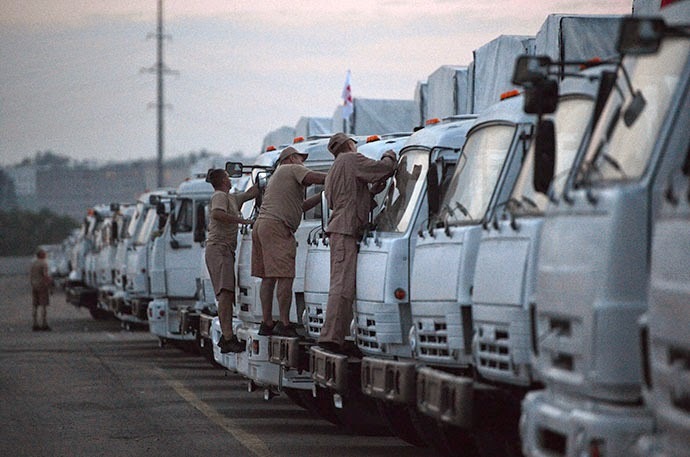 Sending an "invasion" of humanitarian supplies instead of the military invasion NATO has attempted to bait Russia into could not have been a bolder and strategically superior move. The ball is in the West's court - and the West has decidedly dropped it once again.